The Sword and the Rose, (first released on July 23, 1953) is a United States family and adventure film, produced by Disney and directed by Ken Annakin. The film features the story of Mary Tudor, a younger sister of Henry VIII of England. Based on the 1898 novel When Knighthood Was in Flower by Charles Major, it was originally made into a motion picture in 1908 and again in 1922. The 1953 Disney version was adapted for the screen by Lawrence Edward Watkin. In 1956, it was broadcast on American television in two parts under the original book title. Tells the story of Mary Tudor and her troubled path to true love. 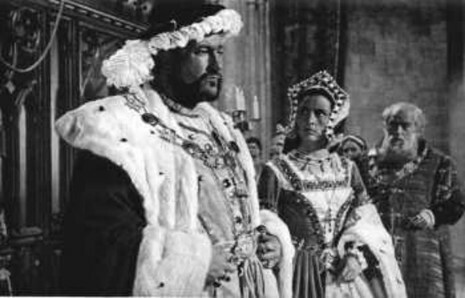 Henry VIII, for political reasons, determines to wed her to the King of France. She tries to flee to America with her love but is captured when she is "un-hatted" on board ship. In return for her consent to the marriage with France, Henry agrees to let her choose her second husband. When King Louis of France dies, Mary is kidnaped by the Duke of Buckingham. He tries to force her to marry him but she is rescued by her love in an exciting battle on the beach.